(Photo: The Chapter of St Paul's Cathedral / Graham Lacdao)The Rt. Rev. Justin Welby delivers the blessing for the first time as Archbishop of Canterbury on February 4, 2013. 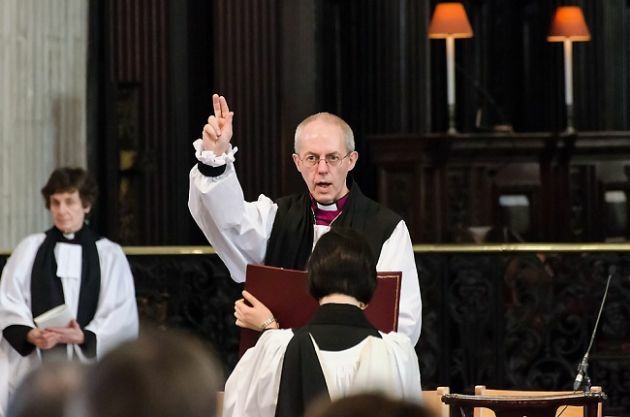 The Archbishop of Canterbury, Justin Welby, has not yet been enthroned, but he has already run into a collision with Britain's ruling coalition following a warning that changes envisaged to the benefit system could drive children and families into poverty. "It is essential that we have a welfare system that responds to need and recognizes the rising costs of food, fuel and housing," said Welby, who will be enthroned on March 21 as the highest ranking cleric in the Church of England and the spiritual head of the 80-million strong Anglican Communion. "The current benefits system does that, by ensuring that the support struggling families receive rises with inflation. These changes will mean it is children and families who will pay the price for high inflation, rather than the government." The archbishop is among 43 bishops who have written an open letter condemning Government plans to change the benefits system, saying it will have a "deeply disproportionate" effect on children. Welby is married and has five children of his own, although media reports have said he is wealthy. The letter is in support of the Britain's Children's Society, a charity, and it is also signed by the Archbishop of York, John Sentamu. The government has arugued that cuts to Britain's welfare system and other areas are need to fight the country's debt problem and one minister belonging the to the dominant Conservative Party argued that the system that currently exists is not fair. Before he was ordained a priest in 1992 the 57-year-old Welby was a banker and oil executive. He had served as a bishop for less than a year before being confirmed as the head of the Church of England on February 4. The welfare bill will be debated in the Britain's upper chamber of parliament, the House of Lords later in March and bishops who are members have tabled an amendment in an bid to see child-related benefits made exempt. The letter was carried the Sunday Telegraph newspaper on March 10, calling on politicians to "protect" children and families. "The bill will remove this protection from rising costs of living for working and non-working families alike; families who are already facing a daily battle to make ends meet. These changes will mean it is children and families who will pay the price for high inflation, rather than the government," says the letter. "'Politicians have a clear choice. By protecting children from the effects of this bill, they can help fulfill their commitment to end child poverty." But Iain Duncan Smith the cabinent minister who heads work and pensions hit back in an interview with ITV News. "This is about fairness. People who are paying taxes, working very hard, have hardly seen any increases in their salary and yet, under the last government, the welfare bill rose by some 60 percent to £200 billion. That means they have to pay for that under their taxes, which is simply not fair. "That same system trapped huge numbers, millions, in dependency, dependent on the State, unable, unwilling to work. "What is either moral or fair about that? That's my challenge over to the bishop."